The Department of German Studies of Faculty of Arts was established as a separate independent Department on 6th August 1982. It is today only one of such Department in the entire region of UP, Bihar, Jharkhand, Orissa, Eastern and North-Eastern India, where one can study German from Beginners' Level through BA, MA and to Ph.D. in German Studies. The teaching of German Language was however introduced in the 40s and thus it was one of oldest centre of German learning in India. Initially German was functioning as a section of Department of English and German was offered as part-time evening course. In the 4th Five Year Plan, the university created the Department of Foreign Languages and German was one of the constituent part of it. Full time BA in German was started. In 1972, M.A. in German was introduced. Research programmes started in 1974. The Department joined in the promotion of Indo-German Cultural Exchange Programme. 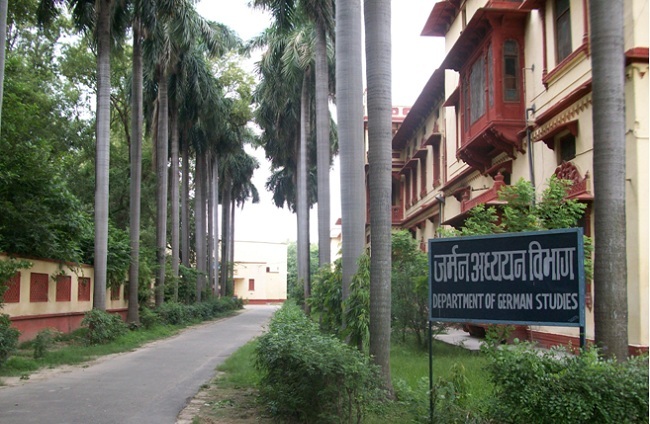 The German Academic Exchange Service [DAAD] deputed regularly a German language lecturer to the Department through HRD Ministry, Government of India. Besides DAAD and Germany, the Department also maintains a good level of co-operation with the other German Speaking countries, namely Austria & Switzerland. Regular visits of many distinguished scholars from German speaking establishments and institutions are arranged. The Department of German Studies has a well established teaching and research programme. It has its own library and computers with internet for the use of students and visiting faculties. German is taught both as full-time and part-time courses covering language, literature & linguistics.